Apple had an event today, and if you were anywhere near the internet, you most likely saw some of the digital commotion wrought by the company’s live-reading of a press release. To kick off the event, Apple talked privacy and and environmentalism. 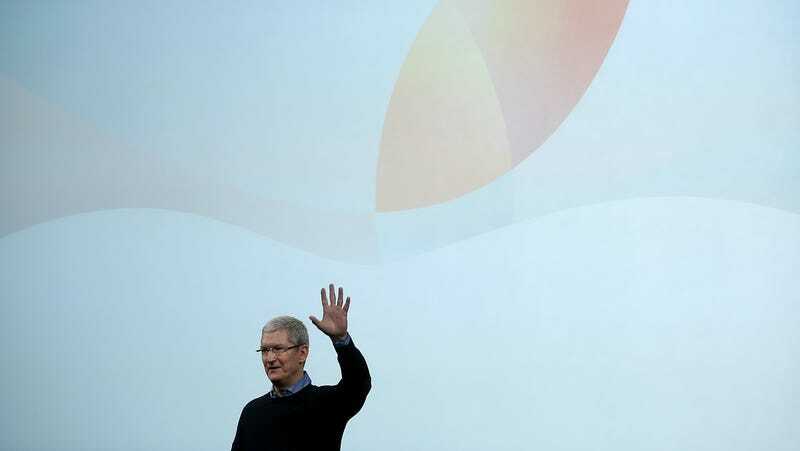 Tim Cook reiterated his company’s stance against the governments efforts to create an insecure version of iOS. Considering the hearing begins tomorrow, today’s event couldn’t have been a better way to drum up support in advance. Medicine advances at an incredible pace, but tools people use to help keep track of their treatment can be laughably archaic. Apple’s new CareKit allows developers to build digital tools to help people with diseases keep tabs on their treatment, and to see what’s working and what isn’t. CareKit is launching first with a Parkinson’s app. If it works as advertised, CareKit is a potentially revolutionary product—but also another data treasure trove for Apple. Apple Watch got NYLON BANDS and a $50 price cut. Apple TV (fourth gen) has 5,000 apps and new software features like app folders and broader Siri support. iOS 9.3 came out, but we already knew about it. Greg Joswiak told a surprisingly small crowd in Apple’s town hall that in 2015, 30 million people bought an iPhone 5s, a two year old phone. Hearing the cries of the small-handed, Apple’s killing off the iPhone 5s only to resurrect the more powerful iPhone SE in its place. In all reality, it’s not a new phone. It’s basically a 6s trapped in a 4-inch 5s body, minus 3D Touch. It’s starts at $400 for 16GB, which is actually quite good considering the tech packed inside. But it’s a Frankenstein’s monster of a phone—a godsend for those with minuscule mitts and big heaping pile of “meh” for everyone else. Yep. Apple, announced a new iPad today, too, and much like the iPhone, it’s also copied from Apple’s past gadgets, mainly last year’s iPad Pro. The 9.7-inch iPad Pro had at least some noticeable differences over its larger brother. First, is what Apple’s calling a True Tone display, employing ambient sensors to accurately capture “paper white” in whatever color environment. Also, it’s got a way better camera with the 12 megapixel sensor that’s capable of shooting 4K footage—the same found in the iPhone 6s. Other than tacking on another 256GB of storage and a Smart Keyboard built for its more diminutive size, it’s basically exactly what it sounds like: a smaller iPad Pro.